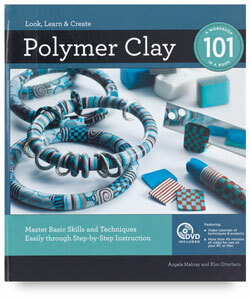 Learn the basics for crafting with polymer clay in Polymer Clay 101 . With hundreds of detailed photos, this book covers tools, supplies, and all types of beading techniques, while terrific projects inspire you to make your own custom designs. With more than 45 minutes of video, the included DVD is a valuable learning tool that shows co-author Angela Mabray demonstrating essential techniques. The DVD is both PC-compatible and Mac-compatible and can be viewed on Quicktime software. Authors — Kim Otterbein and Angela Mabray. 8¼" × 9½" (21 cm × 24 cm).